Media design is an interesting beast in the theatre. Designers are called upon to create digital scenery, interactive installations, abstract imagery, immersive environments, ghost like apparitions, and a whole litany of other illusions or optical candy. The media designer is part system engineer, part installation specialist, and part content creator. This kind of design straddles a very unique part of the theatrical experience as it sits somewhere between the concrete and the ephemeral. We’re often asked to create site specific work that relates to the geometry and architecture of the play, and at the same time challenged to explore what can be expressed through sound and light. One of the compelling components of ASU’s School of Theatre and Film (SoTF) is its commitment to staging new works. In addition to producing works that are tried and true, ASU also encourages its students to create works for the stage. As a part of this commitment the department has developed a three phase program to serve the process of developing a work for full main-stage production. Phase 1 – Phase one is between a staged reading and a work-shop production of a play. This phase allows the team to focus on sorting out the nuts and bots of the piece – what is the play / work really addressing and what are the obstacles that need to be addressed before it moves onto the next stage of production. Phase 2 – Phase two is a workshop production environment With a small budget and a design team the production team creates a staged version of the work that operates within strict design constraints. Here the lighting plot is fixed, scenic elements are limited, and media has access to two fixed projectors focused on two fixed screens. This phase is less about the technical aspects of the production, and more focused on getting the work up in front of an audience so that the writer and director have a chance to get some sense of what direction to move next. Phase 3 – Phase 3 is a full main-stage production of a work. Here there production has a full design team, larger budget, and far fewer constraints on the implementation of the production. While productions can skip one of the stages, ideally they are produced in at least one phase (either one or two) before before being put up as a phase three show. This semester I was selected to be the media designer on call for the two original works slotted in as Phase 2 productions: Los Santos, and The Halfway House. These two new works are both written by current ASU playwrights, who are invested in receiving some critical and informative feedback bout their work. The beginning part of this process begins with production meetings where directors pitch their visions of the production and start the brainstorming / creating process with the designers. Ultimately, Los Santos decided against using any media for their production. Halfway House, however, did decide that it wanted some media driven moments in their production. My role in this process was to work with the director to find the moments where media could be utilized in the production, film and edit the content, and program the playback system for the short run of the production. After reading through the play a few times I met with Laurelann Porter, the director, to talk about how media could be used for this show. Important to the design process was understanding the limitations of the production. In the case of the Phase 2 productions, the projectors and screens are fixed. This limitation is in part a function of reducing the amount of tech-time, as well as limiting the complications imposed a set and lighting when doing complex projection. Looking at the script I thought the best use of media would be to enhance some of the transition moments in the production. Several of the transitions in the show involve moments where there is action taking place “elsewhere” (this is the language used by the playwright). These moments seemed perfect for media to help illustrate. In meeting with the director we identified the major moments that would benefit from some media presence, and started brainstorming from there. After talking with the director and identifying what moments were going to be mediated material, it was time to create a shooting list, and plan for how to use a single afternoon with the actors to record all of the necessary footage for the show. We had one afternoon with the actors to film the transition moments. I worked with the director to determine a shooting order (to make sure that we efficiently used the actors’ time), and to identify locations and moments that needed to be captured. From here it was a matter of showing up, setting up, and recording. This transitioned smoothly to the editing process that was a matter of cutting and touching up the footage for the desired look. The School of Theatre and Film currently have two show control systems at our disposal. Dataton’s Watchout4 and Troikatronix’s Isadora. Given the timing of the phase 2 productions, I knew that the Isadora machine was going to be available to me for show control. 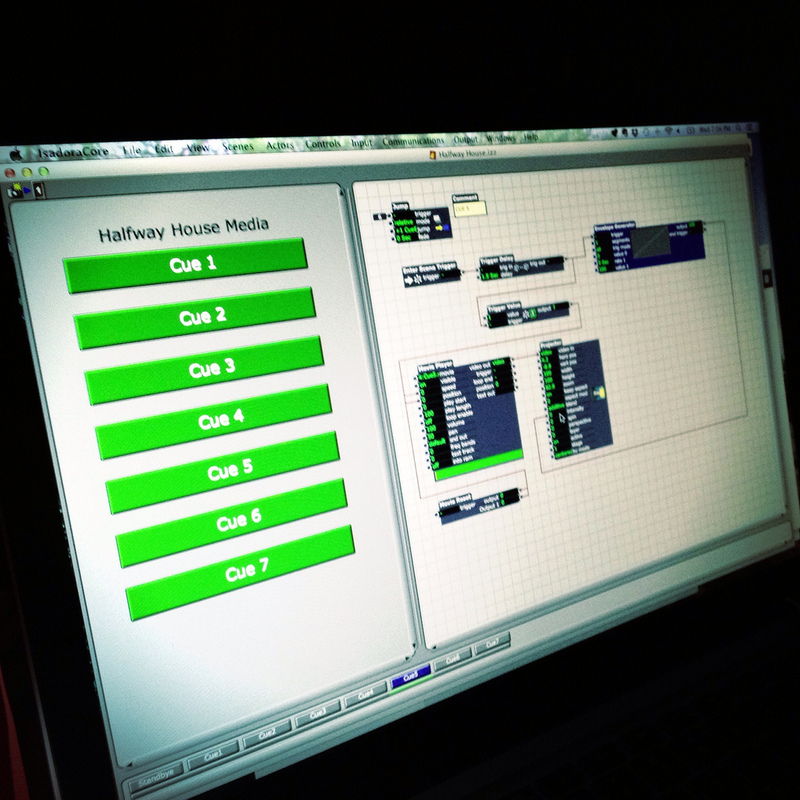 Like MaxMSP, Isadora a is a node-based visual programming environment. Importantly, Isadora is truly designed with performance in mind, and has a few features that therefore make it easier to use in a theatrical production environment. Typically a theatrical production requires a additional steps for media that are similar to the lighting process – lensing, and plotting for example. For the Phase two productions the the shows use a standard lighting and media plot that doesn’t change. This means that there’s little additional work in terms of projector placement, focusing, masking, and the like that I have to do as a designer. For a larger production I would need to create a system diagram that outlines the placement of computers, projectors, cable, and other system requirements. Additionally, I would need to do the geometry to figure out where to place the projectors to ensure that I had a wide enough throw with my image to cover my desired surfaces, and I would need to work with the lighting designer to determine where on the lighting plot there was room for this equipment. This element of drafting, planning, and system design can easily be taken for granted by new designers but it’s easily one of the most important steps in the process as has an effect on how the show looks and runs. With all of the physical components in place, and the media assets created the designer is now looks at programming the playback system. In the case of Isadora this also means designing an interface for the operator. 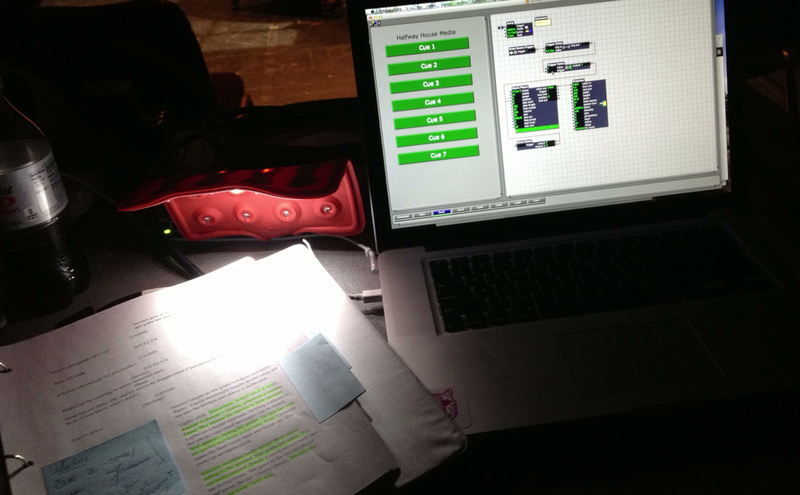 One of the pressing realities of designing media for a theatrical installation is the need to create playback system knowing that someone unfamiliar with the programming environment will be operating the computer driving the media. 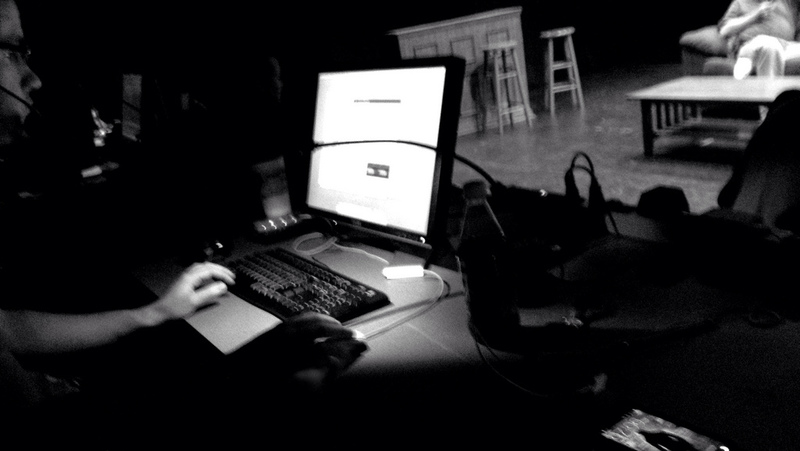 ASU’s operators are typically undergraduate students that may or may not be technical theatre majors. In some cases an operator may be very familiar with a given programming interface, while others may not have ever run media for a show. Theatre in educational institutions are a wonderful place for students to have an opportunity to learn lots of new tools, and get their feet wet with a number of different technologies. In this respect I think it’s incumbent upon the designer to create a patch that has an interface that’s as accesible as possible for a new operator. In my case, each moment in the show where there is media playing (a cue) has corresponding button that triggers the start, playback, and stop for the given video. Media is notoriously finicky in live performance. It can be difficult to program, washed out by stage lights, perform poorly if it’s not encoded properly, or any host of other possible problems. In the case of Half Way House, the process went very smoothly. The largest problem had more to do with an equipment failure that pushed back equipment installation than with the editing or programming process. While this is a simple execution of using media in a production, it was valuable for a number for the individuals involved in the process – the director, lighting designer, sound designer, and stage manager to name only a few. There are large questions in the theatre world about the role of media in production – is it just fancy set dressing? how is it actively contributing to telling the story of the show? is it worth the cost? does it have a place in an idiom largely built around the concept of live bodies? And the list goes on. I don’t think that this implementation serves to address any of those questions, but for the production team it did start the process of demystifying the work of including media in a production, and that’s not nothing. This entry was posted in production and tagged Arizona, ASU, FAC, Isadora, media design, Media Installations, programming on March 19, 2013 by raganmd.